The way smartphones are getting bigger and bigger; it looks like Tablets are dying. But, there are still some manufacturers that don’t want to give up despite the fact that the popularity of the tablets has decreased considerably in the market. Apple is surely the first name that comes to the mind when we think of the few smartphone companies that are still launching tablets. 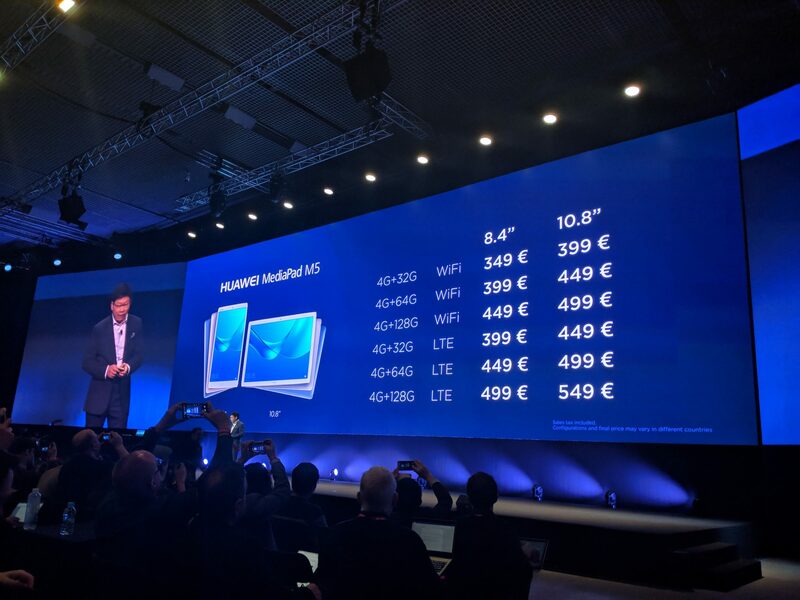 Huawei seems to be following the same footsteps as the company announced it new tablets today at the Mobile World Congress. We are talking about the Huawei Mediapad M5 series that includes an 8.4-inch, 10.8-inch, and a ‘Pro’ variant. As mentioned above, there are two different sizes – 8.4-inch and 10.8-inch. The tablets differ in just the screen size and the battery as rest is same for both. Both have Enhanced ClariVu displays with 2560 x 1600p resolution and 2.5D curved glass on top which Huawei claims to be the first for tablets. Both of them are powered by the Kirin 960 chipset along with Mali-G71MP8 GPU. There are two memory variants of the each tablets – 4GB RAM + 32GB ROM and 4GB RAM + 64GB ROM. We all know that camera is something that isn’t that great on the tablets, especially Android tablets. But, the Huawei Mediapad M5 seems strong in that department too. There is a 13MP rear camera with f/2.2 aperture and PDAF. On the rear, there is an 8MP camera with the same f/2.2 aperture. It is weird that there is no LED flash on either side. Both the tablets feature stereo speakers with HUAWEI Histen sound effect and are Harman Kardon audio certified. So, the audio output is surely going to be impressive. The Huawei Mediapad M5 8.4-inch comes with a 5,100mAh battery while the 10.8-inch variant comes with a 7,500mAh battery with Quick charge.There is a USB Type-C Port on the bottom. Lastly, Android Oreo runs out of the box with Emotion UI 8.0 on top. WHAT’S SPECIAL WITH THE HUAWEI MEDIAPAD 5 PRO? 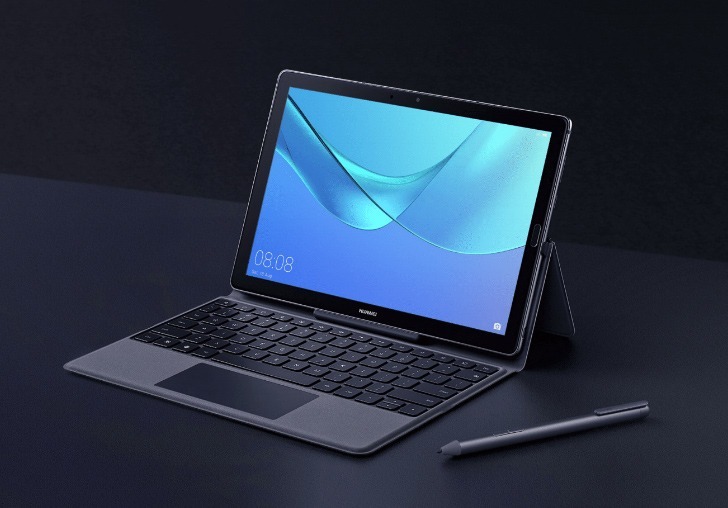 Apart from these two variants, there is also a ‘Pro’ variant of the Mediapad 5, and it features Pogo Pins on the side so that you can use a physical keyboard with it by attaching the keyboard to the tablet using these ping. The tablet also comes with the Huawei M-Pen, which is a stylus that has 4,096 levels of pressure. Well, that’s the only difference between the normal 8.4-inch/10.8-inch variant and the ‘Pro’ variant. The shipping will begin in March, and the tablet is going to be available in most of the European countries and also in the US. There are two color options – Space Gray and Mystic Silver. So, what are your views on these new tablets from Huawei? Do let us know via the comments section.